﻿﻿	How to Payment for Thai Stamp Shop? 1. PAYPAL or Credit Card (Minimum order requires $10 USD) ***Recommended method, it's fast and easy! PayPal, the trusted leader in online payments, lets you send money online quickly and securely. Over 100 million users have a PayPal account, and it's accepted by merchants everywhere, both on and off eBay. You could easily pay with your credit card directly via payment gateway provided by Paypal without signing up paypal account. Or you could pay with your paypal account. PayPal account - choose this method if you pay by your PayPal balance, or a credit card that linked with your PayPal account. Direct credit card - choose this method if you have not a PayPal account and would like to pay by charging directly from your credit card. The payment will be processed by PayPal payment gateway which is secure and reliable. ***You must registering for an account and upload fund to your account before making the payment to us. This is the alternative way for the customes who cannot making payment by the first method. 1. 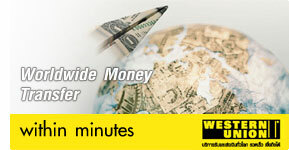 Visit any Western Union agent displaying a Western Union sign and fill in a "To Send Money" form. 2. Present the completed form, the money you wish to transfer and any applicable transfer fees, as well as your photo ID and supporting documents (Up to the requirement of each agent). 3. Lastly, In form us the essential transfer details via email, including the Money Transfer Control Number (MTCN) with 10 digits number, your name, the country the money is being sent from and the total amount of funds to be transferred. * When you choose this method, we will send you more details of the Bank you have selected. Please specify the Bank's name you want in the Additional Comment field on the Check Out page. $ USD and € EUR. Other currencies, please email first. Please Note: This method is the buyer's risk. We are not responsible for any lost. So, please carefully packing and send by Registered Mail everytimes.